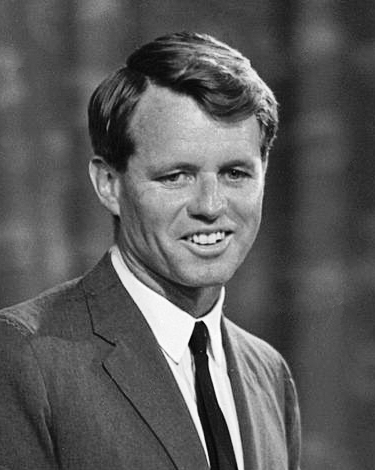 Brother of President John F. Kennedy, RFK served as attorney general in the Kennedy cabinet and was also the president’s most trusted adviser, playing a key role in defusing the Cuban Missile Crisis, which had the potential for igniting World War III. As attorney general, Kennedy enforced federal policy and Supreme Court rulings mandating the racial integration of public facilities, schools, and universities. In 1965, he became a U.S. senator, and in 1968 began a campaign for the Democratic Party presidential nomination, running against incumbent Lyndon B. Johnson as an opponent of the Vietnam War. His presidential bid ended in his assassination after triumphing in the California primary.